We are writing to you on behalf of a unique coalition of businesses, associations, investor groups, local and regional authorities, and civil society organisations. In 2015, European leadership helped deliver the Paris Agreement. and the call from seven Member States to align EU climate ambition with the Paris Agreement. The EU is widely acknowledged for its long-standing commitment to tackling climate change through robust policy-making. However, the current level of ambition is insufficient and hampering Europe’s chances of reaching the Paris goals. An enhanced level of ambition is critical to the ability of our organisations, businesses, cities, regions, and community-led initiatives to accelerate the transition to a zero-carbon Europe. On 13 June, key European stakeholders will be discussing ways to step up EU ambition on climate action at the High-Level EU Talanoa Dialogue. This is an important milestone ahead of the European Council in June where you will be discussing the bloc’s climate and energy frameworks of the future, in light of COP24 in Katowice. We need Europe to transition to a sustainable society and economy as soon as possible, to allow for improvements to public health, greater competitiveness for businesses, and an increase in good quality jobs. This will allow all of us to reap the benefits from the decarbonization of Europe. To deliver on this, Europe needs to stimulate rapid and long-term investments in the energy transition, particularly in efficiency and renewables. At the same time the EU should incentivise transformational change in the transport and agricultural sector, protect and restore our natural ecosystems and support the transition of local economies through local action. Such an approach will be more credible and influential on the global stage, regaining its status as a committed leader on climate action and in the energy transition. By stepping up its commitments, the EU can limit the extent of climate impacts, abroad and domestically thereby significantly reducing the economic damage from climate change which would otherwise amount to hundreds of billions of euros every year . Ensure the finalisation of the EED, RES and Governance files in line with the ambition levels adopted by the European Parliament. 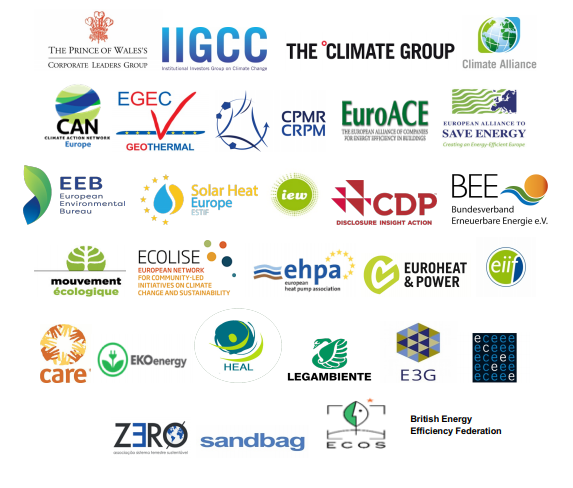 Ensure that the long-term strategy under development sets Europe on a pathway that delivers on the 1.5°C objective of the Paris Agreement, which must include a net-zero emissions target by 2050 at the latest, as supported by the European Parliament. Ensure that on the basis of this long-term strategy, a timely revision takes place of the 2030 greenhouse gas emissions reduction target so as to allow the EU to lead by example and resubmit its new Nationally Determined Contribution (NDC) well in time for the 2020 deadline agreed in Paris. More than ever, we stand ready to play our part in support of the objectives of the Paris Agreement. To realise our potential, we need EU leaders to deliver on their part: a commitment to more ambitious climate action and a rapid energy transition. The urgency has never been greater, but neither have the opportunities.